Queen of Wands (R) says recognize the people in your life who are narrow minded, possessive, manipulative and controlling. The people who are vindictive, take a domineering approach and are exceptionally strict and unbending – always demanding that life respond in a positive way. Too much disaster or opposition from life can turn them deceitful, unfaithful and bitter. It is essential that you demonstrate your self – trust now. Do not abandon yourself in any way. Your internal and external experiences are revealing self – knowledge. Your basic good nature and positive attitudes, as well as your energy make you invaluable in a crisis or disaster, for you just naturally support others in crisis – while at the same time offering good advice, consultation and emotional support. See with intensity – remove any obstructions to your clear view. KNOW the “dark side” – bridge the conscious and the subconscious and discern which avenue will produce the best results for everyone concerned. Distortion – too a greater or lesser degree. A fire and brimstone personality – out of touch with reality, undeveloped spirituality. How are you expressing your creative energies? Who is giving you lots of good ideas and energy? When do you feel powerful and passionate? Who is strong – willed and protective? In the first position: In the extreme, this can be a lifetime given over entirely to getting more of God’s message into the Earth plane. It can be much more difficult for those around you than for you who understand what is taking place. In the second position: The people or the guides on whom you have relied are not available/reliable in the present situation. In the third position: This suggests that you are needed to help another or others with their spiritual house. In the fourth position: Distorted, this otherwise very healthy archetype can become a block instead of a blueprint/foundation for love and creativity. At one extreme, the figure is idolized and idealized and real life will find it hard to compete. At the other extreme, the future is loathed and by extension either all women or all of certain types of women are not to be loved/trusted. In the fifth position: You may think adversely about this queen or she about you. Confusion or subversion of a message may be taking place. In the sixth position: If this is someone already in your life, there are emotions to deal with here as one or the other of you turn away. In the seventh position: If this represents someone already in your life, this may show a turn of mind between you. There may be a lack of confidence derivative from a fear of the unknown or of listening to inaccurate or inappropriate sources. In the eighth position: There is little that can cause more trouble than intercepting someone else’s message and working with it like it was your own. In the ninth position: Your heart may be involved with the queen, but rather not be. Or, the opposite, this can be the symbol of her heart’s sadness over this person. A reversed card is simply “lessor than” the upright position. Queen of Wands represents advanced female maturity in spiritual communication. The eighth position represents the influence of others in your life. When you read for others, you need not “understand”, you learn to trust in what you are hearing/feeling/sensing and leave your own “ego and opinions” out of the interpretation. There is no “exact” meaning of the cards that can be applied to all readings – you are combining the energy of the total cards to come to a conclusion which in itself is not static, but fluid and can be changed by the choices of the one receiving the reading will make after hearing what you say. Spirit knows what they need to hear and you can trust in that. Can you tell what is meant with the inverted queen of wands in the eighth position. There is little that can cause more trouble than intercepting another’s message and working with it as your own? 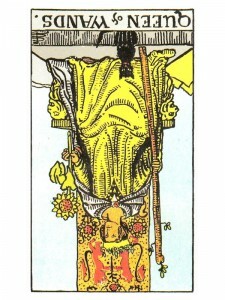 Inverted king of wands in the 9th position.